You can integration WP eMember with WooCommerce so you can accept membership payment via WooCommerce. Step 1) Download the integration addon plugin from here. Step 2) Install the addon just like any other WordPress plugin. 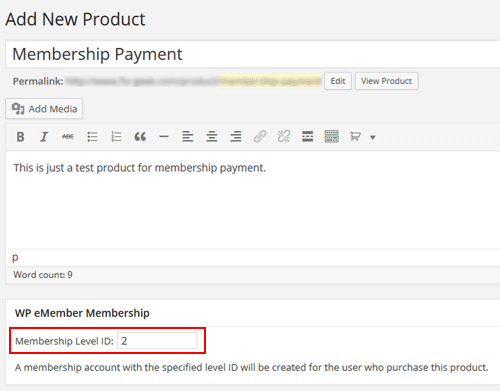 Step 3) When creating a new WooCommerce product (or editing one), you can specify a membership level for that product. Now, when a customer purchase this product, a membership account (for the specified access level) will be created for the user. Note: Your WooCommerce checkout for all products in the shop stay as is. The eMember plugin will ONLY monitor the product checkout for products where you have specified a membership level ID. When you specify a membership level ID value in a WooCommerce product, you are telling our plugin that this product is for a membership payment. There are a couple of different ways you can setup the membership registration scenario. In this setup, you just use WooCommerce to do the checkout. The user/member account creation process is completely handled by eMember. You will turn off all the WooCommerce account creation options from the “Accounts” settings of WooCommerce. A visitor buys a membership product from your WooCommerce store. Once the payment is confirmed, WooCommerce will notify the eMember plugin. At this point the plugin knows what membership level this user paid for, the plugin will create the appropriate membership account for this visitor. The member will receive an email that contains a “unique” link to complete the registration. When the member clicks on that link in the email it will let him choose a “username” and “password” and complete the registration. At this point the member can log into the site via eMember and enjoy the premium members only content. Your membership products are virtual products. So make sure the “Virtual” and “Download” options are enabled in your WooCommerce product in question. This way the order will immediately go to “complete” status after successful payment. This setup is good for users who want to use the account creation option of WooCommerce. Go to the Admin Functions menu of eMember and enable the auto create eMember account feature. Create a free membership level (just so you can use it as a default level). Also, you can optionally enable this feature to keep the user records in sync. Once the payment is confirmed, WooCommerce will create a WP User account for this user (just like it does for any product checkout). Then WooCommerce will notify the eMember plugin. eMember will create a corresponding eMember user record then upgrade that account to the appropriate membership level (the one this user paid for). At this point the member can log into the site via eMember and enjoy the members only content. Our plugin will only process orders/payments that are set to “processing” or “completed” status in WooCommerce. This is to make sure the money has been received before the member account gets created (or updated). If your WooCommerce setup is correct, then the order status will be set correctly after an online payment is received. So it should work in an automated fashion. However, if you are accepting manual payment then you need to review your order and set the order status correctly after you receive money from the customer. You can also use an WooCommerce extension to set the order status to complete automatically (after you receive an order). This is optional but you should enable this setting so when members log into the site via eMember’s login, they automatically get logged into their WooCommerce account (and vice versa).